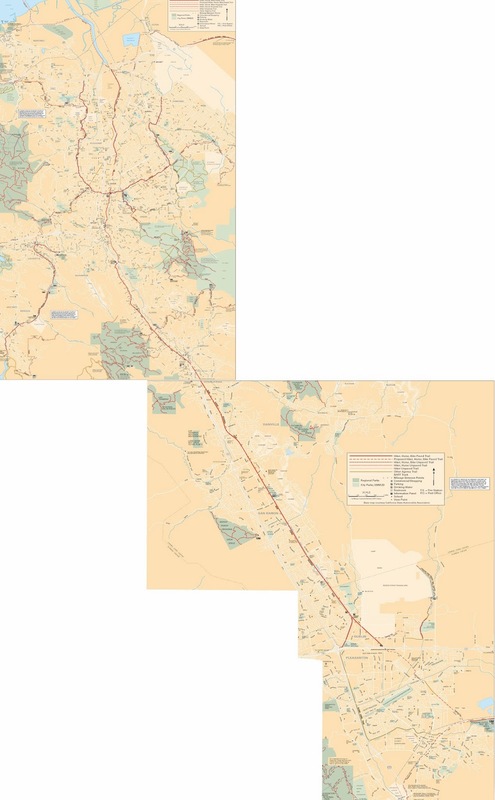 The Iron Horse Trail extends from Dublin all the way to Martinez (a distance of about 55 miles). The trail was part of the Southern Pacific Railroad right of way from 1891 until it was abandoned in 1977. We've seen several other counties (El Dorado County, Yolo County, etc.) that have turned their abandoned railroad tracks into parks and trails. This part of Contra Costa County is called the 'East Bay' and is an idyllic area to go for a walk or a ride. I spent some time hiking the Iron Horse Trail and the adjacent Contra Costa Canal Trail (see photo) in Walnut Creek. However, these trails were narrow and without any markings to separate bicyclists from pedestrians. It became nerve wracking as the bicyclists were constantly interrupting my reverie with calls of "On your left!" There are several old and new footbridges on the trail, which we will be studying over the next few days. Contra Costa County, California Bridges: Iron Horse (and Contra Costa Canal) Footbridges by Mark Yashinsky is licensed under a Creative Commons Attribution-NonCommercial-NoDerivatives 4.0 International License.